Artist's rendering of a binary star system in which a black hole siphons matter from a companion star, generating two jets of energy that shoot out along the black hole's axis of rotation. Until recently, black holes have remained hidden beneath invisibility cloaks. Whereas a lot has been known about the existence and properties of black holes from Einstein's theory of general relativity, tangible evidence has been a recent phenomenon. Have astronomers gained wizard-like powers to view these regions in space that are so dense that nothing, not even light, can escape their gravitational pull? Not quite. Rather, indirect evidence from X-ray telescopes has revealed telltale signs of thousands of black holes lurking in our own galaxy and beyond. Many are the remnants of exploded stars. But to other far more massive black holes, swallowing a single star is like Mount Everest absorbing a snowflake. With their X-ray vision, and other techniques, researchers are monitoring the chaotic environments around these black holes trying to solve some longstanding mysteries. Black holes exist in at least two different sizes, according to astronomers. Stellar black holes, formed from the death and gravitational collapse of a massive star, weigh in at 10 to 20 solar masses. Dwarfing the stellar type, supermassive black holes hold millions to billions the mass of our Sun, and lurk at the centers of many galaxies. It remains unclear whether a middleweight class exists, as some astronomers have suggested. Over thousands of years, black holes grow bigger by consuming material whizzing around them. 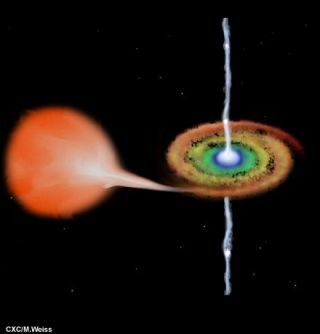 Just before gas and dust get sucked into a black hole, this matter heats up so much that it emits streams of X-rays. NASA's Chandra X-ray Observatory and other telescopes equipped with X-ray vision spot the distant lights. That's how astronomers pinpointed the first stellar black hole, called Cygnus X-1, in 1971. Since then, thousands of black holes have been spotted, bringing to light answers to many questions. And in 2001, observations of Cygnus 1 provided the first glimpse of material actually falling into a black hole. "We are answering a lot of questions, but as usual for every question that you answer two new ones pop up," said Christopher Reynolds, an astrophysicist at the University of Maryland, College Park, in a recent telephone interview. Here's a longstanding head-scratcher: How does a black hole manage to vacuum up the gas and dust orbiting around it? Just like the mechanism that keeps planets orbiting the Sun, angular momentum should keep this gas and dust coasting around black holes forever. "Because a planet has angular momentum, it keeps going around the sun. And this gas will do exactly the same thing. Unless something disturbs it, it will just keep on orbiting the black hole," Reynolds explained. Astronomers have known that gravity alone couldn't pull off this tall order. But it wasn't until recently that lead author Jon Miller of the University of Michigan in Ann Arbor and his colleagues, including Reynolds, found evidence for the role of magnetic fields. The team studied GRO J1655-40, a binary system composed of a seven-solar-mass black hole that is consuming gas pulled from its companion star. Images from Chandra revealed a wind of charged particles blowing out from the gaseous accretion disc. And the group says that a magnetic field is powering this glowing wind. The charged breeze could zap the accretion disc's spin energy. With its prey weakened, a black hole could then slurp up the nearby particles, the thinking goes. There's still more to learn. In 2000, Andrea Ghez, an astronomer at the University of California, Los Angeles, and colleagues, obtained the most detailed observations yet of the area around a super-massive black hole, one residing at the center of our galaxy and packing 3 million to 4 million times the mass of the Sun. The existence of this galactic black hole had been suspected for decades, but atmospheric turbulence had prevented clear images of activity very near the behemoth. For four years Ghez watched as stars zipped around the galactic center at speeds of more than 3 million mph (5 million kph). From the orbits of some of the stars, Ghez could estimate the black hole's mass. Similar observations by a European group in 2002 confirmed the mass of the black hole and the fact that in theory at least, it can't be anything but a black hole. Ghez said that it isn't entirely clear how these galactic black holes form. "But one idea is that they may have formed from the first generation of stars in our Universe that were much more massive than stars that form today," she told SPACE.com. Of course, with her findings came another mystery. Ghez and others have spotted very young stars near this super-massive black hole. Theory tells us that a black hole's titanic tug should prevent stars from forming. "This creates a "paradox of youth" problem," Ghez said. So even with more probing, black holes remain some of the most enigmatic inhabitants of the Universe. To peer into some other stellar mysteries, check out SPACE.com's Top 10 Star Mysteries.